The United States has launched five separate complaints at the World Trade Organization against Canada, China, the European Union, Mexico and Turkey in response to retaliatory tariffs those countries and groups have launched against the United States. 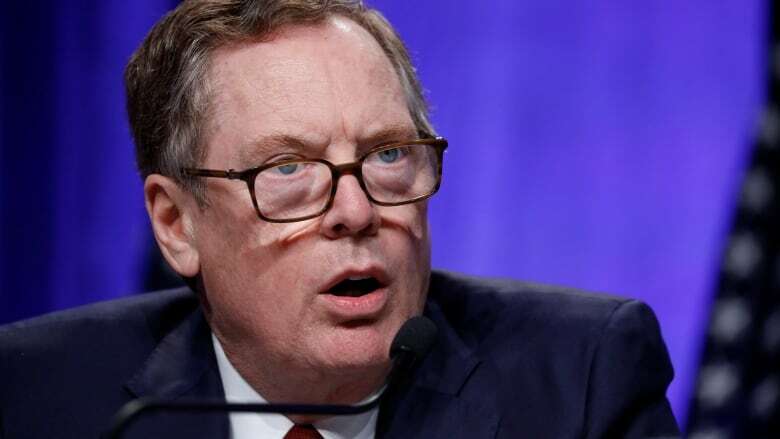 U.S. trade representative Robert Lighthizer said in a statement Monday that recent tariffs implemented by the U.S. on foreign steel and aluminum are "justified under international agreements," but retaliatory measures from other countries in response are not. "Instead of working with us to address a common problem, some of our trading partners have elected to respond with retaliatory tariffs designed to punish American workers, farmers and companies," Lighthizer said. The United States earlier this year put a tariff of 10 per cent on imported aluminum, and 25 per cent on steel, in addition to other targeted measures on foreign-made goods. Other nations hit by those tariffs have launched counter-measures of their own, which so far target $24 billion US worth of American-made goods, but are soon set to increase exponentially. Last week, the U.S. proposed a new round of tariffs on $200 billion US worth of Chinese goods, and China is disputing those tariffs in a WTO complaint of its own, also announced Monday. The WTO is an international body that adjudicates trade disagreements between member nations. Member nations usually adhere to any rulings the WTO finds, but the process can be so slow and cumbersome that many disputes ended up being remedied elsewhere at some point anyway. Cyndee Cherniak, an international trade lawyer at LexSage in Toronto, says it's interesting that the U.S. is choosing to go the WTO route in this case, since the country has been dragging its foot on updates that would enhance the agency's power to mediate trade squabbles. The U.S. has stopped appointing people to the appellate body of the WTO that would allow it to handle more cases, more quickly, she said. "The U.S. is making it impossible for there to be a final decision on the five cases they just brought." The reason for that, she suggested, is a more sinister motive at play. "Without a functioning court, they can do whatever they want, because there's no one there to tell them they can't do it." "We are caught in a litigation limbo," said Cherniak.